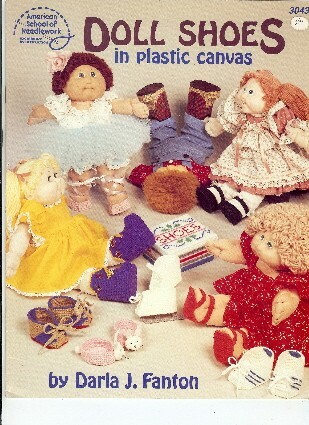 American School of Needlework Doll Shoes in plastic canvas pattern booklet. Darla J Fanton. Baby Shoes, Saddle Shoes, Hiking Boots, Tennis Shoes, Sandals, Mary Janes, Ballet Slippers, Bedroom Slippers, Majorette Boots, Cowboy Boots, Ice Skates, Roller Skates, Shoe Box. Out of print. Sticker on cover. Some very minor shelf wear at bottom corner.